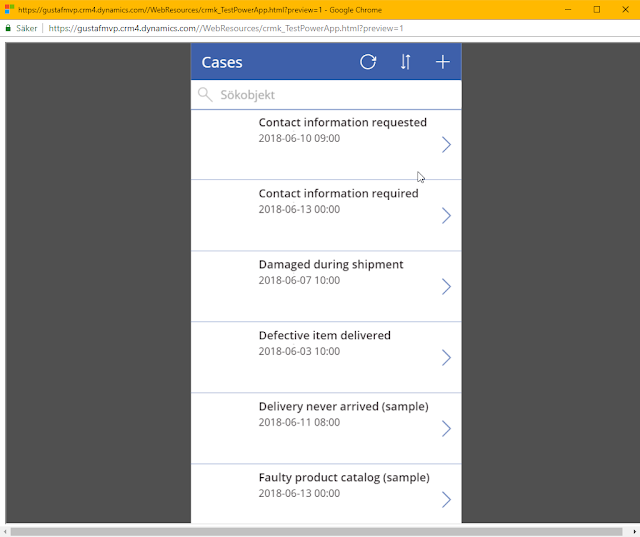 PowerApps or as the new name for it is, Canvas driven Apps, is a very fast low/no-code way of creating applications that can fill in the blanks where Dynamics 365 CE sometimes fit. Can for instance be when there is a mapping entity, a complex calendar functionality or even integrations with a camera or other applications directly. These things can be done, some are even supported within the new UI/UCI if you are running it through the tablet/mobile client. However, there is currently no easy way that I have found to just add a PowerApp/Canvas Drive App (I will just call it PowerApp below to make things easier) to Dynamics. But after a chat with my friend, ex MVP and now Microsoft Global Black Belt Carsten Groth (isn't that a cool name for a team by the way?) he told me that it is possible to embed PowerApps. 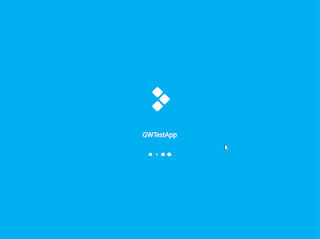 So I googled a bit a found that no one seemed to have blogged about this (if you have, please tell me in the comments) except for other it concerning other applications like SharePoint. 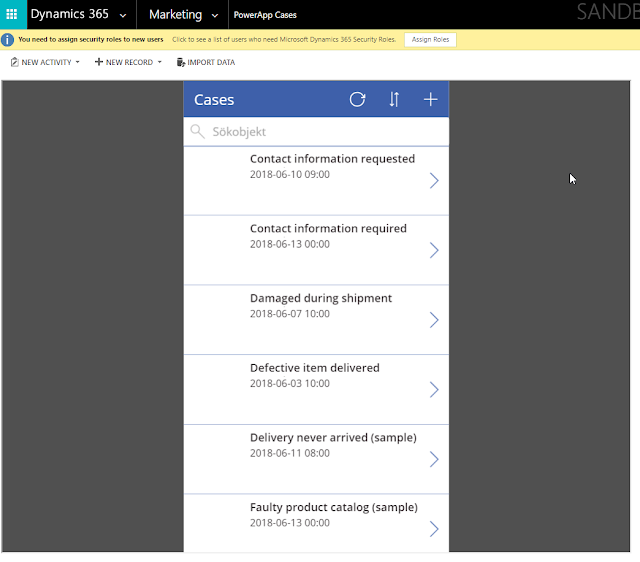 I tried it out and found that it wasn't that hard at all to embedd a PowerApp into Dynamics 365. 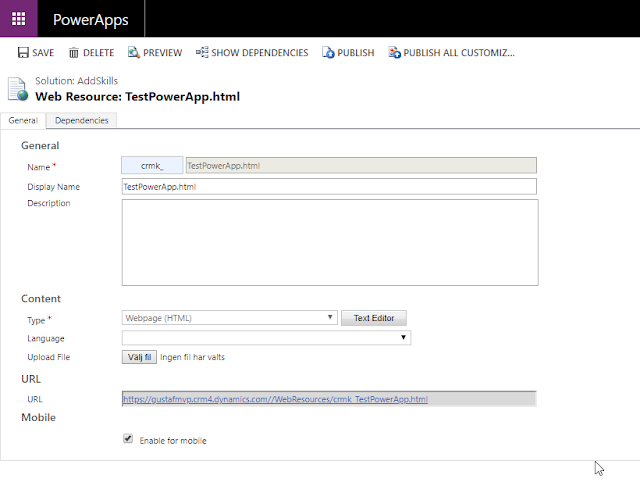 The first thing we have to start with is to create our PowerApp. 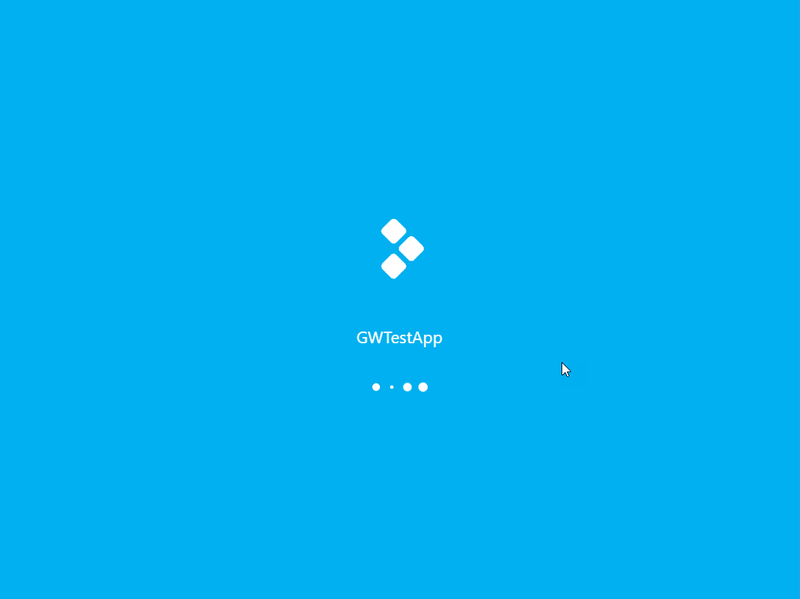 You can get to this place by browsing to https://web.powerapps.com or clicking the waffle in Office365 and then selecting PowerApps. In my case, I used the Dynamics 365 template and pointed to the Case Entity and did more or less pressed Next-next-finnish. I did replace the field that was shown in the first screen from the Guid of the case to the field "title" as that makes a little bit more sense looking at. You need to replace the [AppId] with your AppId. Also, if you do not specify it, the iframe it will typically render rather small so I would recommend either setting the size of it directly with width and height attributes or using css, the latter being more kosher. Then I uploaded this file as a webresource to Dynamics. After uploading it, in the WebResource screen, you can test the page by clicking on the URL. 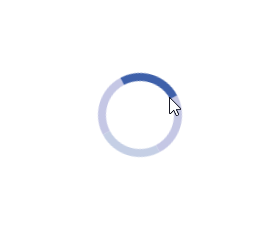 It should show a webpage with the PowerApp. Added PowerApp webresource to the Marketing Area as a Subarea called "Power App Cases"
It should be possible to send parameters to the PowerApp as well making them context aware so that we can create PowerApps that for instance show up within a case and show specific data on that case after you have selected it in Dynamics 365. However, if you look at the iframe syntax you will see that the AppId and stuff is already a parameter and I need to research this a bit more to be able to figure it out. I think that the html web resource probably has to shuffle the query string parameters from Dynamics to PowerApps. I will leave this hanging and hope that someone else in the community catches this ball! Otherwise I will try to figure it out later. As CDS (common data service) and Modular Driven Apps are the same thing as Dynamics 365, just with less sugar on top, this technique can be used there as well. If you find anything unclear or have any questions, please leave a comment (moderated).